Today was the official end of the penny in Canada, as the Royal Canadian Mint halted production and went into collection mode. While pennies will continue to be legal tender indefinitely, retailers as of today will begin rounding to the nearest nickel for cash purposes. 10. Cut off without a penny. 9. A penny saved is a penny earned. 8. Penny for your thoughts? 7. Here are my two cents. 5. In for a penny, in for a pound. 1. …And the penny drops. 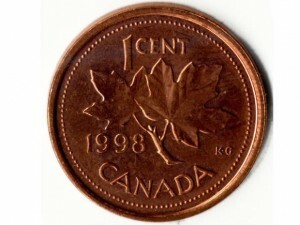 RIP, Canadian penny. I can’t say I’ll miss you weighing down my purse. But it does feel like the end of a chapter in history. Previous post: Hockey’s back, baby!